Officers of the 100th/442nd take the oath of office. More than 200 attended the joint luncheon of the Military Intelligence Service Veterans Association of Southern California and the 100th/442nd Association Installation last Saturday at Almansor Court in Alhambra. It was the first time the two veterans groups held their luncheon together. Sameshima and Laura Shigemitsu, president of the 100th/442nd, both greeted the gathering. 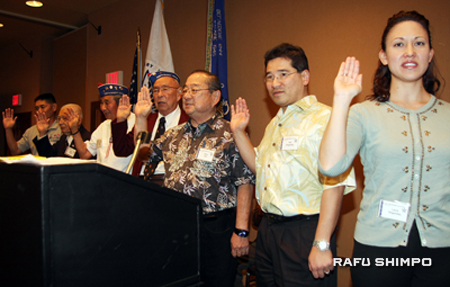 Gary Yamauchi, former Alhambra mayor, served as master of ceremonies at an event in which many representatives of the leading Japanese American organizations came to pay tribute to the accomplishments of the Nisei veterans, including receiving the Congressional Gold Medal. The Los Angeles Congressional Gold Medal ceremony will take place on June 9 at 9 a.m. at the Go For Broke Monument in Little Tokyo. Greg Kimura, the new CEO of the Japanese American National Museum, made one of his first public appearances since taking over at the museum to pay tribute to the veterans. He introduced himself as a fourth-generation Japanese American from Anchorage, Alaska. “We call it a two-degree separation in Alaska, everybody knows everybody, and that’s certainly true of the Japanese American community. I think we’re all actually related,” Kimura said. George Nakano, chair of the Go For Broke National Education Center, announced that the organization is currently exploring existing facilities to house its long-discussed education center within Little Tokyo. Earlier plans had called for the construction of a new center next to the Go For Broke monument. “If we wait too long, it’s not going to be at a point where the veterans can celebrate and enjoy it. I thought we should take a look at existing buildings, retrofit it, remodel it and getting it done,” said Nakano. The largest applause came for Rep. Adam Schiff (D-Pasadena), who introduced legislation to award the Congressional Gold Medal to veterans of the 100th Battalion, MIS and 442nd Regimental Combat Team. “I can say very sincerely that working on the Congressional Gold Medal legislation has been one of the great pleasures of my life because it has put me into contact with some of the most incredible heroes in the history of our country – some of whom are in this room today,” Schiff said. Junichiro Suzuki, director/producer of “MIS-Human Secret Weapon” showed a trailer for the documentary, which will be screened in Southern California this spring. The film is the last in a trilogy of documentaries exploring Japanese American history. 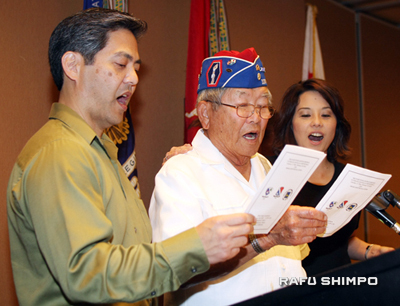 From left, Kurt Kuniyoshi, Don Seki and Helen Ota sing "Aloha O'e."